Half brother to PUDDIN N PIE 3, 1:59.4f ($55,540), and MUSCLES MY WAY 3, 2:00.2f ($34,910). Dam is a half sister to SIR WINSTON 3, 1:55.4; 4, 1:53.2; 1:53.2f ($407,702) and LORD NELSON 4, 1:59.1f ($32,405). Immediate family of World Champion QUEEN SERENE 2, 1:57.1; 3, 1:52; 4,1:51.4 ($748,602), dam of MUSCERENE 5, 1:53.4f ($103,986) and PRINCESS DEO 2, 1:55.1 ($88,231); MUSCLE KING 3, 1:54.4; 4, 1:54.1f ($571,882); MALEDICTORIAN 1:57.3f ($155,801); KINGAPORE 3, 1:55.2; 1:54.4-15 ($124,680); QUEENS ON FIRE 3, 1:56.2 ($41,182); and Bar Queen 2, 2:02.2, dam of BARHAM HANOVER 2, 1:57f ($375,786), BUCKETLIST HANOVER 3, 1:54.2f ($99,664), etc. Half brother to Shake A Leg 2, 2:06.1h. 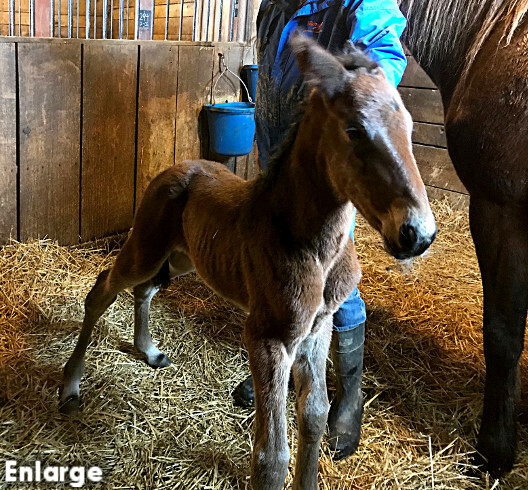 Third foal from ONSS-GF winning LEGZY 3, 1:55.4 ($274,473), a half sister to WILSONATOR 3, 1:56 ($470,188), dam of THE ROYAL HARRY 2, 1:57.3; 3, 1:54.4f ($269,024), HILLSONATOR 3, 1:55.4; 4, 1:55 ($127,401), and DARLA P 2, 1:58.1f-18 (28,355); VIMY RIDGE 5, 1:55.4; 1:53f ($189,651); REALLY REALY SWEET 5, 1:56.1f ($129,841); SARATOGA NATIONAL 5, 1:55 ($117,605); ANIKAWIESAHALEE 3, 1:59.2h ($54,235), dam of Yonkers International, Cutler, TVG FFA, Maple Leaf Trot winner RESOLVE 3, 1:54.1f; 4, 1:50.4; 1:50.2 ($2,621,086) and ANIKADABRA 2, 1:56.3; 3, 1:56f-17 ($83,809); HMS FIRECRACKER 3, 1:56 ($61,829); and THE BACK NINE 4, 1:56 ($25,979). Half brother to Spring Away 21 - 5 - 2 - 4 with $106,747 in earnings. Dam is a half sister to PRAYER FOR RELIEF, 46 - 8 - 6 - 10 and earnings of $2,277,948, now standing stud in Florida; winner of West Virginia Derby (G2), Super Derby (G2), Iowa Derby (G3), Prairie Meadows Cornhusker H. (G3), Governor's Cup S., Tenacious H.; second in Mervyn LeRoy Handicap (G2), Texas Mile S. (G3), Lone Star Park Handicap (G3), Pimlico Special S. (G2), Governor's Cup S., Real Quiet S.; third in Woodward S. (G1), San Fernando S. (G2), Strub S. (G2), Californian S. (G2), Suburban Handicap S. (G2), Al Maktoum Challenge Round 1 (G2), Hal's Hope S. (G3), Oklahoma Derby, Louisiana H., Meydan Racecourse H.; former World Record holder TWIN SPARKS, 6 furlongs in 1:06 2/5, winner of 9 races and $156,955; Spark of Humor, winner of 11 races and $254,786; High Side, winner of 5 races and $140,872; and winners Boudiceas Revenge and Spark Kit. 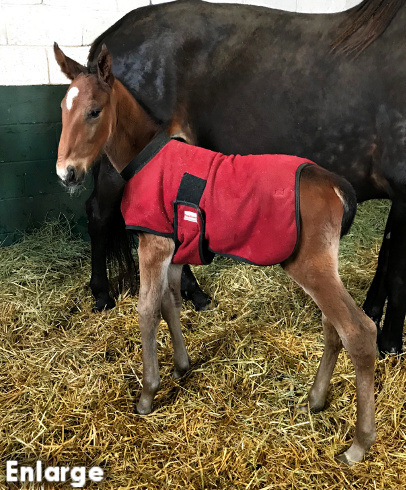 Fourth foal from a full sister to SWAN FOR ALL 2, 1:54.3; 3, 1:54.1f ($309,986), sire of World Champion and 2017 Horse of the Year HANNELORE HANOVER 3, 1:54; 4, 1:51; 1:49.2 ($2,473,814); and full or half sister to SWAN IMAGE 3, 1:55.2; 4, 1:51.4 ($628,952); MAGIC SWAN 2, 1:57.2, 1:59.2h; 3, 1:56.2, 1:56.3h; 4, 1:55.1f ($450,047); SWAN IN A MILLION 2, 1:57f; 3, 1:55.2; 4, 1:53; 1:52.4 ($350,404); SWANDERFUL 2, 1:58, 3, 1:56.2; 4, 1:54.3 ($150,391); and SWAN HOT MAMA 3, 1:57f, dam of REPENTANCE 2, 1:56.1f; 3, Q1:53.3-18 ($230,660) and ATONEMENT 2, Q2:00-18 ($15,550). 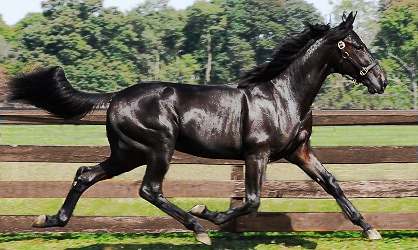 Immediate family of World Champion POSSESS THE MAGIC 2, 1:54.2; 3, 1:54.1 ($1,043,503), dam of MASTER OF LAW 4, 1:52 ($536,651); and MUSICAL VICTORY 2, 1:55.3z; 3, 1:55 ($502,384), dam of MUSICAL RHYTHM 3, 1:54.2; 4, 1:51.2 ($542,956), PHOTO KING 5, 1:53.2f ($367,155), MUSICAL MYSTERY 2, 1:56.2; 3, Q1:55.2 ($290,952), MUSICAL SPELL 4, 1:54.3 ($135,529), etc. 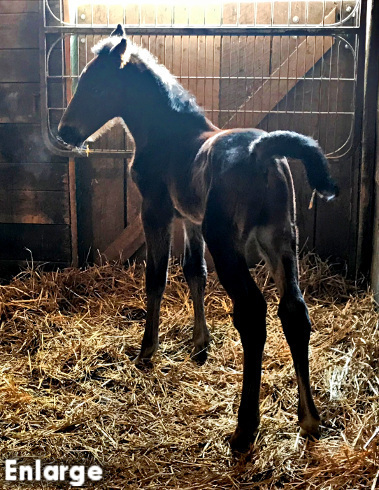 More Foals On the Way!